Everyone does get negative at some point in his or her life. Whether it is at work or home negative situations happen almost all the time. It is rather unfortunate that we cannot avoid them and thus beg the question of how can we change these negative thoughts to positive ones. It is important to be positive in adverse situations, even though it might sound hard or rather impossible, it is very much possible to stay positive no matter the situation. Learning the power of positive thinking assists us to remain in a positive state of mind even in the midst of a tragedy. Additionally, knowing how to convert that negative energy into positive energy can lead to a healthy and comfortable lifestyle. I have come up with five ways of how you can avoid being negative and when you put this five key points in mind you will be cheerful and even see some light of positivity in any situation that you may encounter. 1. Stay around positive people. Hanging out with positive people will certainly help you stay positive. You should avoid negative people because they will only rub off their negativity off on you. They will bring you down from trying to achieve positivity to been a cynical person once more. 2. Remind yourself what you are grateful for. In negative situations, we tend to find ourselves thinking of the good things in our lives. You should voice those good thoughts and practice gratitude. Develop a culture of talking about the good things that happen to you other than focusing on the bad ones. Also, it is ideal to keep a journal of all the good things that you have done on a daily basis. By acknowledging what you are grateful and thankful for will help you nature a grateful heart and mind, even in adverse situations. 3. Own up to your mistakes. If you mess up, take responsibility. If you do something good, reward yourself. Do not blame other people for things that are your fault. This only brings a negative energy towards you by thinking all the negative things about that situation. Instead, accept the situation as it is and move on with life. 4. Avoid drama in your life. Drama is an unfortunate and nasty characteristic to have. Part of avoiding drama is preventing dramatic people. Avert the gossip at all cost. It will do you no good and only helps to spread negativity. By being kind, you will not have time for negative thoughts. Do various acts of kindness every day. This will keep you in a happy spirit. Besides, karma will also pay you back handsomely for your kind deeds. Negativity is everywhere, heck even in weddings, days that are considered to be the happiest days in a person's life. You will most likely find some few negative people there. It is important to transform yourself into a positive thinker since you will end up living a happy and healthy life. So be positive, and life will be positive with you. 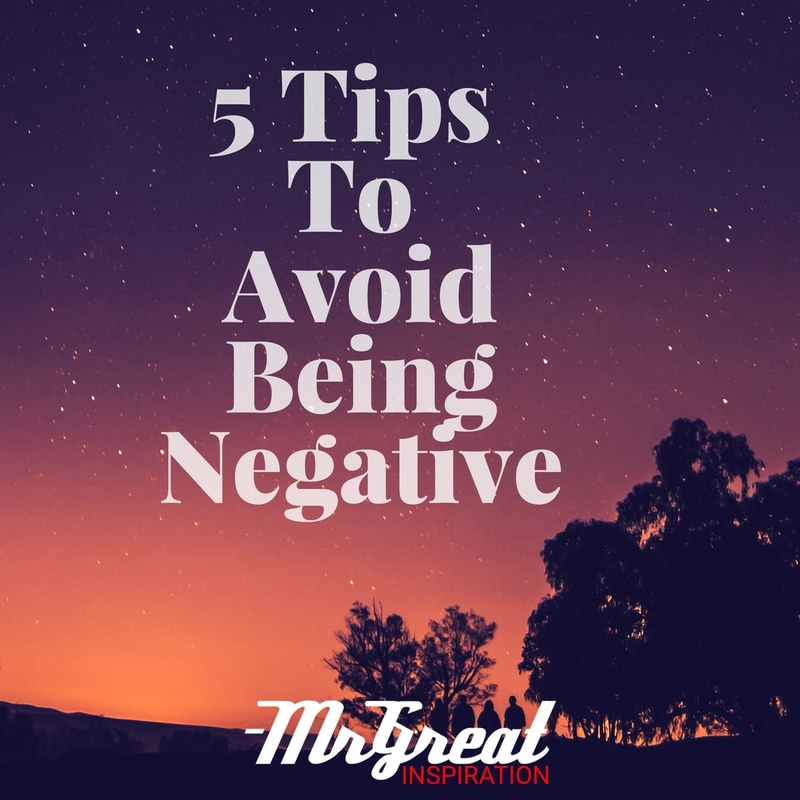 We hope guys you find our article "5 Tips To Avoid Being Negative" by Mr Great Inspiration useful.